A poor plumber rumbles. While fixing a water basin’s leak, he goes stiff as teak. Around him the lady of the house grumbles, her husband blumbers on about lack of cash, a jolly grandpa’s teeth gnash. Now bol baby bol, how’re you to react to this family’s hellzapoppin’ events in the jade greenscapes of Coonoor? Padhariye, then, cautiously into the world of a classic dysfunctional family. As it happens, the script – chalo, let’s say coincidentally – reveals influences from Hollywood’s The Royal Tenenbaums (a cutie-pie patriarch with a penchant for hot stuff, the waterfall ablutions of Mandakini from Ram Teri Ganga Maili in this case), Adaptation (a writer faced with what else but a writer’s block? ), Home For The Holidays (a clan running riot at a festive dinner), and last and maybe the least Monsoon Wedding (skeletons of the super-serious kind leap out from the closet). Wait, wait, not to forget producer Karan Johar’s celebration of the bipolar experience of celebrating khushi with dollops of gham. So is it all just hum dee humdrum in the Shakun Batra zone? Gratifyingly, not. Although the director’s style zigzags perilously between the hip and the hackneyed, there is still something complex and edgy about his ensemble of characters which nurses secrets, lies and animosities galore. Consequently, a gamut of topics are explicated right from adultery and sibling rivalry to same-gender sexuality. Also the differing values of three generations are offered without passing any moral judgments. The element about alternative sexuality is dealt with subtly, much too subtly perhaps to prevent it from becoming the core point of the film, but it’s there. At the very least, mainstream cinema is a-changin’. Right. 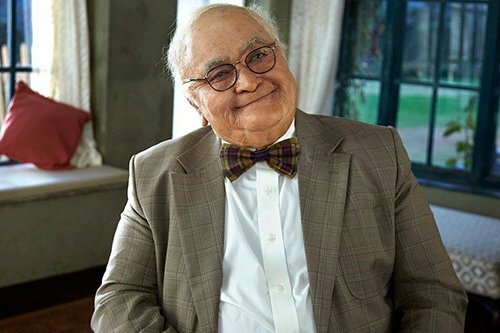 Quite appropriately, the film frames Grand-daddy Kapoor (Rishi Kapoor) as the purest of them all. However, not without his momentary lapses of reason. He enjoys ogling at dirty picture on his ‘I-papaad’, sneaks drags at marijuana joints, cheats at cards and constantly displays a ribald sense of humour. He’s a lecherous sort and proud of it. Above all, he pines for a family portrait before he breathes his last. Touching. As for his daughter-in-law (Ratna Pathak) and her cuckolded husband (Rajat Kapoor), they seem to have lost their compass, going helter-skelter with their long-unresolved grievances. As for the Kapoor grandsons (Fawad Khan and Sidharth Malhotra), they strive to sort out their conflicts as novel writers. In vain. That bid at a truce is exacerbated by the uninhibited girl (Alia Bhatt) who lives down the hilltown’s lane. Oh oh. Which of the brothers is apni Miss Lane really soft on? That turns out to be a no-brainer actually. Never mind. The trio breathes a calfish innocence during their romantic interplay, or the lack of it. Unusual. Quantums of beer are swigged, an intimate house party’s enlivened by them track Kar Gayi Chull. And a soft ballad-like tryst in a graveyard, plus a flirtatious date at a downbeat momo-joint are especially well-rendered. For such vignettes, Kapoor & Sons is more than likeable. Consistency isn’t the film’s virtue though. Depending excessively on verbose dialogue (which jangles your ear bongos) and scant regard for language (okay people speak incorrect Hindi but how about avoiding ‘Mere ko’ and those gaffes in masculine and feminine nouns? ), are jarring. Moreover quite a few situations are plainly contrived, like a battered car leading to a startling disclosure. Technically, the film is sufficiently glossy. Of the performances, the lead players are professional, with Rishi Kapoor being the most inspired and endearingly emotive of the lot. Ratna Pathak is impressive, despite being hamstrung by an excessively melodramatic part. Fawad Khan is cool, calm and calibrated throughout. Sidharth Malhotra is pleasantly restrained. However, Alia Bhatt is disappointing in her one big emotional scene: she breaks down, weeps, but hello, you can’t detect a tear. Glycerine might have helped. Dilemma: For its merits, I was instinctively inclined to go with three stars, but was assailed by mixed feelings. Kapoor & Sons could have been a wonderful film if it didn’t keep flying around like a plane awaiting landing clearance at an airport. With all its uppers and downers, then, it’s a notch above average.